Properties in Bracebridge average 4.6 out of 5 stars. Million Dollar View of Lake Muskoka! Property 57: Million Dollar View of Lake Muskoka! Property 60: Muskoka Cottage Rental on Moon River! Lake Muskoka all year piece of heaven perfect for family fun. Property 66: Lake Muskoka all year piece of heaven perfect for family fun. Property 67: Muskoka Rose Lakeside Guest House Property on Pine Lake, Gravenhurst, Muskoka. The Perfect Family Summer Waterfront Vacation in Muskoka Huntsville Home! Property 91: The Perfect Family Summer Waterfront Vacation in Muskoka Huntsville Home! Waterfront Muskoka Huntsville Algonquin Home close to Parks and more! Property 97: Waterfront Muskoka Huntsville Algonquin Home close to Parks and more! Gladstone Lodge Authentic Olde Muskoka Log with the comforts of home in Muskoka! Property 98: Gladstone Lodge Authentic Olde Muskoka Log with the comforts of home in Muskoka! 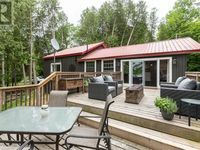 Beautiful common entertaining area with view of lake and OFSC snowmobile trail. Great location to sled in and out of.